Theatre UCF’s production of Hot Mikado brings a unique design concept to the show and to the company: Japanese anime. Based on The Mikado, a comedic 1880s operetta which follows young lovers living in a fictional Japanese town where acts as small as flirting are a capital crime, Hot Mikado sets the original story and lyrics to a jazz-infused score with big, flashy dance numbers. 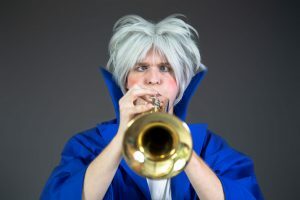 A self-professed lover of “all things Japanese,” director Earl D. Weaver brings Theatre UCF’s upcoming production into the world of anime, using manga comics, kawaii culture and J-pop music videos as inspiration for the over-the-top designs. Hot Mikado is typically set in a 1940s Chicago-style night club, fitting for the jazz, swing and blues music that drives the show. In looking to bring new life to the material, Weaver turned to the design team and said, “What if this were set in a club where it’s Japanese anime night?” The team immediately jumped on this idea and the designers got to work creating a distinctive design. As the team began to explore the style of Japanese culture, the visual concept for the show began to take form. “It started with looking at silhouettes of traditional Japanese architecture but we began thinking about more modern landscapes,” says Marian Jones, scenic designer for the show. “To represent the lighthearted nature of the club, we took inspiration from the iconic style of kawaii culture.” Kawaii is the culture of cuteness in Japan, best known by global audiences in pop culture phenomena like Hello Kitty or Pokémon. Weaver explains that Hot Mikado sets the mood from the start, with the first time audience members see the anime-inspired set and the beautiful costumes. The jazz arrangements provide “that big band sound,” instantly fusing Japanese art and culture with 1940s’ American music. These elements come together to tell The Mikado’s familiar themes: insane politicians, social class divides and forbidden romance. Thursday, Friday and Saturday performances at 7:30 p.m.
Sunday performances at 2 p.m.
A post-show reception will immediately follow the October 11 performance. Please join us for a post-show panel discussion and talkback with members of the cast and crew following the performance on Sunday, October 14.